What walks around comes around. I love when what you put out there bounce back at you. It sort of hits home in a different way. In a coaching session today with one of my clients from Sweden, Michael, he shares his experience completing the Berlin Marathon this passed weekend. 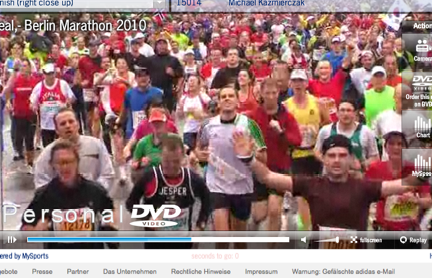 He was running in a steady pace, with a smile on his face, and as he got into a more heavy passage, one of my tweets (!) came to his mind: “Laser Focus!” A tweet! That one tweet kept his focus on the finish line, which he passed at 4 hours and 16 minutes. Congratulations Michael! Thanks for the permission to share your story and celebrate your achievement! Now – I know what I will put my laser focus on today. How about you? What is it that you would love to get done, and believe that you might not be able to? What is it that is urgent and important for you to get out of the way? What is it that is non-urgent but very important that you just haven’t had time to tackle? What if you actually could do it all, if you just gave it a little bit of extra special attention. One more principle that could help on the way: good for now. It doesn’t need to be perfect. As long as it is good enough – that is what matters. Go do it – and share it with others. You don’t know what you can inspire them to do. Just the possibility of it makes it worth it.